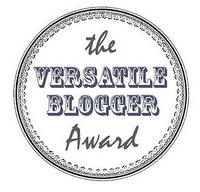 A big thank you to JC Piech of Things Which Burst Out Of My Brain , who was kind enough to nominate me for the Versatile Blogger Award, a cute way of spreading the love for other blogs. More about the VBA here. Congrats to you on your VBA! Mine caused a double in my followers. Hope you have the same or better results.